It’s time to start the challenge and time for some introductions! This post is quite long because we have some reminders to go through. Tip: there is a menu on the right-hand side of this page this will help you navigate the post (you might not see it if you’re reading this on a phone or tablet). For those of you who are new to the challenge, let me introduce myself. My name is Kathleen Morris. 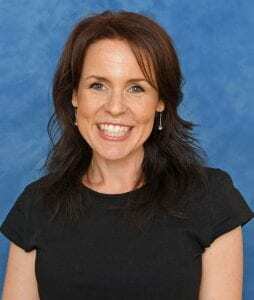 I’m a primary school teacher in Geelong, Australia. I wonder what hemisphere you live in? I live in the Southern Hemisphere so it’s the start of autumn although still very warm. We have had lots of days close to 40 degrees Celsius this week! 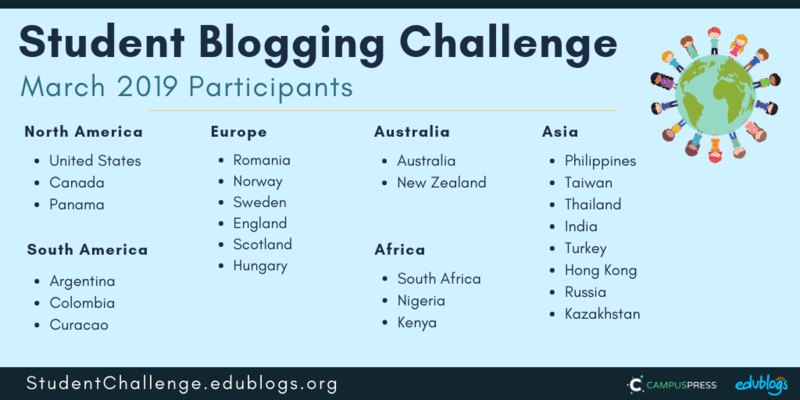 I work with Edublogs to help teachers learn about the wonderful world of blogging while teaching casually. I have a husband who’s a teacher, a 5 year old daughter, and a 4 year old son. I began blogging with my students in 2008. I have my own blog for teachers where I write about things like global collaboration, blogging, digital citizenship, and online tools. All of these things keep me very busy and I also enjoy running, hiking, reading, cooking, and exploring nature with my family. I’m looking forward to getting to know you too. Want to know more about our commenters? Check the comment section of this post. So far we have nearly 800 individual students and 115 classes registered. Our participants represent 25 countries and 6 continents. Are any of the continents of the world not represented? I wonder why? The first 3 weeks will be similar to the last challenge BUT then we’ll be diving into different topics. So, hang in there! Use the first few weeks to improve what you’ve already done on your blog and make connections. You can be a role model for our new participants! We usually have a choice of tasks each week, however, this week, we have three important tasks we’d like everyone to complete. You’ll find more details about these tasks below. Firstly, we have some challenge information and reminders to go through. Each week, we’ll follow the same process. There will be some information on a blog post to read so you can learn more about our topic and then some tasks to choose from. 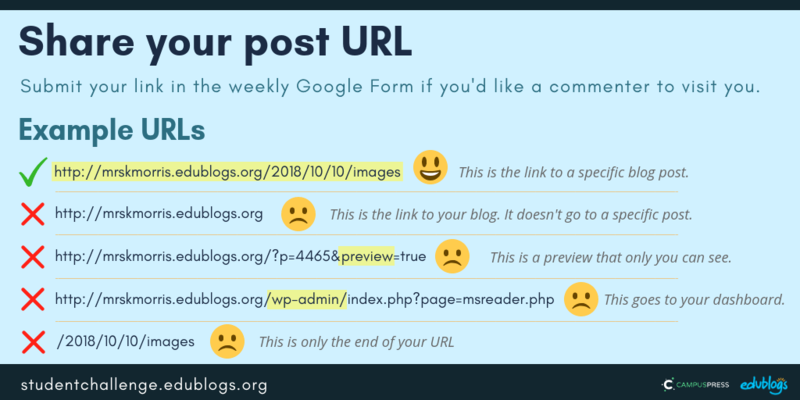 Once you publish your task response on a blog post, submit the URL of the post in the Google Form at the bottom of the weekly post. Then, go ahead and connect with others! Read more about our four step weekly process here or watch the video below. Here is a summary of the weekly process. Feel free to copy this graphic and display it on your blog. This A4 poster version might be handy to print out for students or use as a classroom display. Is your blog public on the web? To take part in the challenge you need to make sure that visitors can view your blog without signing in. To check this, open your blog in a browser you’re not logged into (or something like Chrome Incognito). Does your blog appear? Or is there a prompt for a password? Need more help with changing your settings? Check this post for details. Can visitors leave comments on your blog posts without logging in? Double check this. If you’re using Blogger, make sure anyone can comment using the Name/URL option (so they don’t need a Google Account). Find more instructions to change your commenting settings here. Check our registration pages to make sure your details are listed correctly. If your details are incorrect, just leave a comment on the page so we can fix that up. Click here to go to the student registration page. Click here to go to the class registration page. 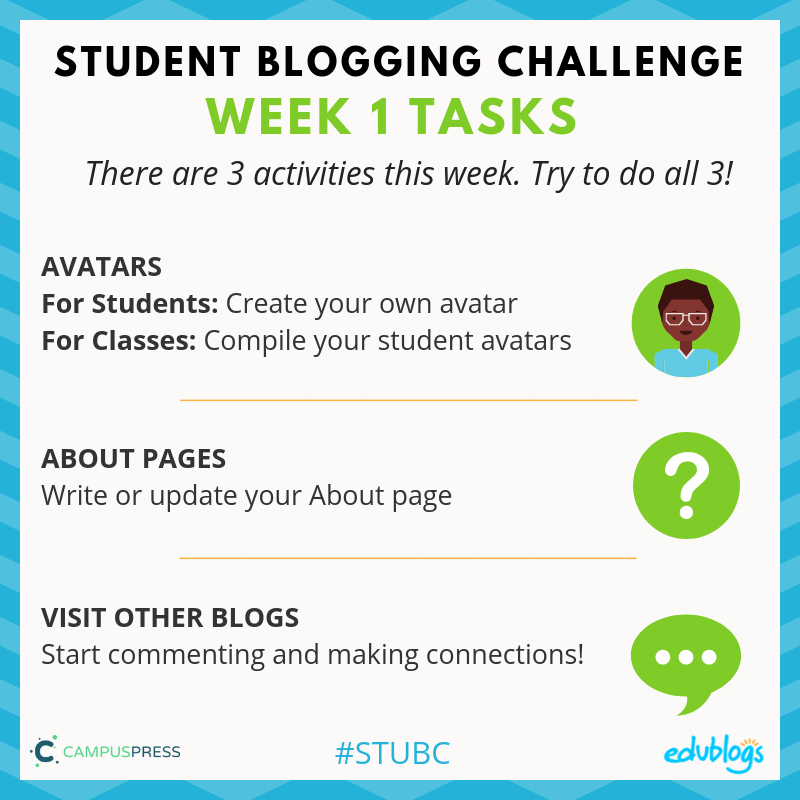 Edublogs/CampusPress users with student blogs — If all the students in your class have blogs and you use ‘My Class’, you should have a widget called ‘Class blogs’. Make sure this is on your sidebar. This video shows you how. Add the challenge badge to your sidebar. There is a post showing you exactly how to do this. Click here to go to the badge post. Please moderate comments regularly — at least once a week if not once a day. It’s in the comment section where the most powerful learning and connections can take place! While you don’t have to complete every task each week, this week we encourage you to try to do all three. They’re very important tasks and will get you off to a great start! Here is a summary. I will explain each activity in more detail below with some examples. Remember, as we’re sharing information about ourselves, we need to be internet savvy and avoid sharing too much information or personal details. I like to tell my students to never share their YAPPY online. There is some other information that’s more of a ‘grey area’. These are things you should discuss with your teachers and parents. 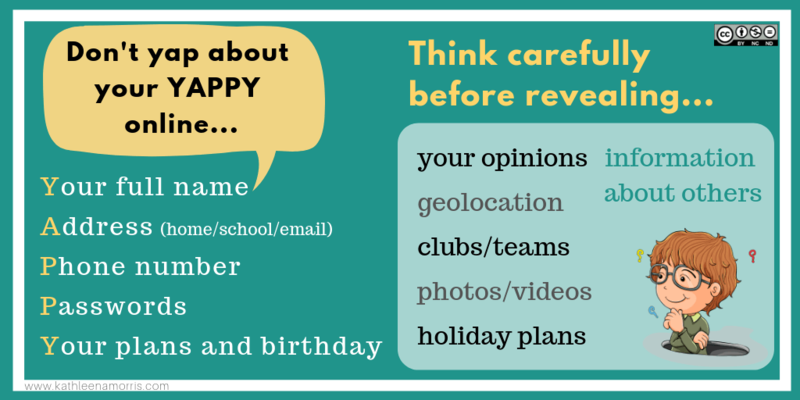 Learn more about digital footprints in this post. Should you publish students’ photos online? Check out this post for advice. Do you know what an avatar is? It’s simply an image that you use to represent yourself on the internet. It’s like a character that represents your online identity. It can be a better idea for children to use a cartoon representation of themselves (check with your teachers/parents if you’re not sure). Here are four avatar activities to choose from. 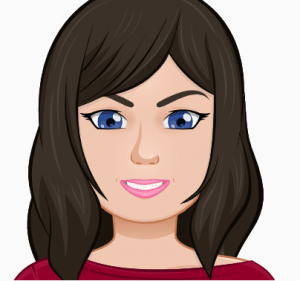 Students can create an avatar to use on their blog. Some tools allow you to save the avatar to your computer to then upload into your blog. Others tools require you to take a screenshot of your avatar and save it as an image. Tip: This article shows how to take a screenshot on any device. The Symbaloo below was compiled by Miss W (Sue Wyatt) to share links to sites where you can make an avatar. If you want to embed the Symbaloo on your own blog, click on the share icon at the bottom and copy the embed code. Some of the tools listed require Flash to work. This means they won’t work on mobile devices and you might have to manually allow Flash if you’re using Chrome (instructions here). Know any other avatar creation tools that aren’t on the Symbaloo? Leave a comment on this post. Once you’ve made your avatar, you need to add it to your blog so it shows up when you comment. If you’re using Edublogs or CampusPress, check here for instructions. If you’re using Blogger, check here for instructions. If you’re using Kidblog, these are the instructions you’ll need. Tell us how your avatar represents you. Include a link to the website where you created the avatar. Remember to include your avatar as an image in your post. Alternatively, you might want to create a custom avatar for each of your family members. Include the avatars in a post and tell us a bit about each family member (remembering not to give away too many personal details). Tip: when writing a post about your avatar, choose an interesting title not just ‘avatar’ as this could cause an error on your blog. Here is an example of a great post from Naho in Hawaii. Braeden made a Lego avatar and wrote about it here. Josh used a range of tools to make avatars for the members of his family. Amelie-Rose made avatars for her family members. Got a class blog? Students can make an avatar using one of the tools mentioned above. You can then share all the avatars on your class blog. You might share your students’ avatars by writing a post that includes a slideshow of your avatars. You can create a video animation using Animoto and embed it in your blog. Check out this example from Room 15. Tip: Animoto offers free accounts for educators. You can make a slideshow using the Jetpack module, following these instructions. This applies to Edublogs and CampusPress users. 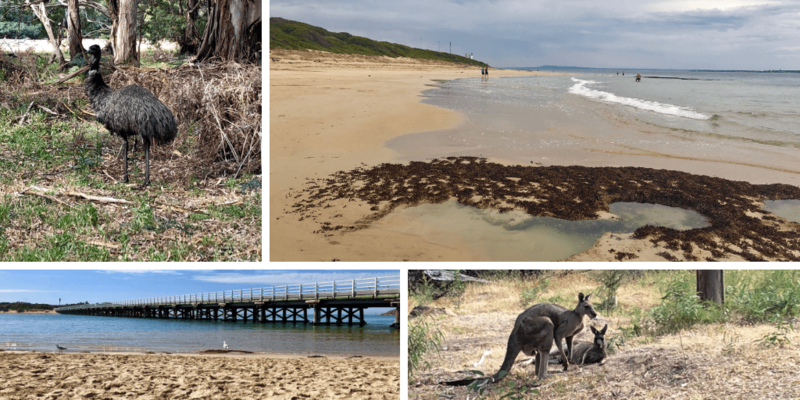 You can add the images to a Google Slide presentation and embed it in your blog. Check out this example from Mrs. Vazquez’s class. She has made us a tutorial to show how to create a Google Slide presentation too. 💡 Here are more examples of Google Slide presentations from Mrs. Slingerland’s 7/8 class and Mrs. Holliday’s Second Grade Class. You can make a custom header image that includes all the avatars. See this example from the Birney Bulldogs (they’ve also added their avatars to their About Page). You will need to use a program like PowerPoint, Google Drawings, Google Slides, or Canva. The first step is to check what size your header is by going to Appearance > Customize in your blog dashboard. If you don’t see the Header Image section in the Customizer it means your theme doesn’t support the use of a custom header image. When you click on Header Image in the Customizer, it will show you the dimensions of your header image. Make a note of this. For example, it might say 1000 x 150 pixels. In your program, you need to change the size of your blank canvas to the size of your header. You’ll then upload the avatar images and arrange them how you like them. Save your creation as a PNG or JPEG and then follow these instructions to upload the header image to your blog. Need more help? Check out these instructions by Stef Galvin. You can add a slideshow of your students’ avatars to your sidebar using the gallery widget. Follow these instructions to find out how. Do you know what the difference between a post and a page is? Posts are where you publish your regular updates. A page is for more static information that you don’t expect to update too often. You might publish lots of posts but only have one or two pages. Find out more about the difference between a page and a post in this article on The Edublogger. Remember, we don’t say, “I wrote a blog”. We say, “I wrote a post” or, “I wrote a page”. If you’re using Edublogs or CampusPress, click here to find out how to add an About page, or watch the video below. If you’re using Blogger, these instructions will help you add pages. If you’re using Kidblog, you might need to add a post instead of a page. The most important page on your blog is your About page. Whenever I visit a blog for the first time, I always look for an About page. It’s a way to find out who’s writing the blog posts, what their background is, where they’re from etc. Some bloggers forget to edit the default ‘sample page’ that appears when you set up a new blog. Or they forget to update an About page that they might have written years ago. 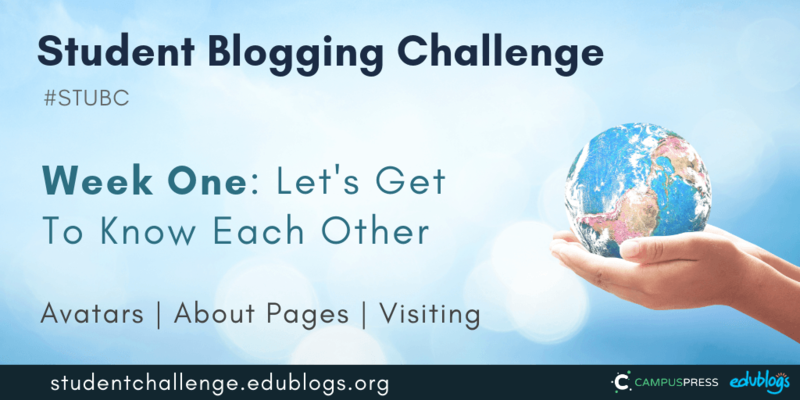 This task involves writing an About page for your student or class blog. If you already have an About page, check to see what else you can add or edit. Be creative! There are many ways to write an About page. Remember to be safe online: don’t include personal details like your YAPPY (see above). You can get creative when writing your About page. Write a poem. It could be a traditional rhyming poem or any other style of poetry. Learn about different styles of poetry here. Here is an example from Daniela. Ms. Mack created a “fun facts” list that links to the students’ blogs. Rina wrote 15 things about me for her About page. Check it out. Write an A-Z about yourself (e.g. I am an athletic and brave child who decided that saving the environment is one of my future goals). Check out how commenter Dinah created her A-Z About page especially for the Student Blogging Challenge a few years back. Zaprina made a creative About post that’s an acronym of her own name. It includes paragraphs and coloured text. Write a ‘Who am I?’ or list of things people might not know about you like Ms. Herring, Mrs. Keane, and Mrs. Lyttle. Students in Ireland paired up to create a line for their class About page and Ms Seitz’ class did the same. Mrs. Moore’s class wrote about their school and where they live on their class blog About page. Huzzah! class included a map to show where they live. Student Rajyashori wrote a creative interview script. Year 5/6 Class at Westwood with Iford School made a Thinglink. If you prefer a traditional style of writing, that’s fine too. Be sure to use paragraphs like in these examples from Grace and Madison. For students or classes: Start making connections! One important aspect of blogging is commenting on other blogs. Remember: The more you put in to making connections during this challenge, the more you’ll get out! The pages at the top of this blog. There is a page for student bloggers and a page for class bloggers. These are sorted by age. Student bloggers have hobbies listed so you hopefully can find someone who is not only a similar age to you but shares some of your interests. The green link on the right-hand sidebar of the blog. This will show you the spreadsheet of students/classes who have submitted their posts in the weekly Google Form. This is the direct link to the week one spreadsheet. Note: You do not need to request access — it’s “view only”. 💡 Idea: You might even like to write a post about your commenting experiences like 7th grader Cashton did for the last challenge. He even included the links in his post. Don’t forget to approve your comments and politely reply to any comments as soon as you can! If you’re working as a class, you might start by writing some comments together as a whole class activity. Students could then write comments individually or in small groups. This video by Mrs Yollis’ third grade class demonstrates how they approach commenting as a whole class activity. 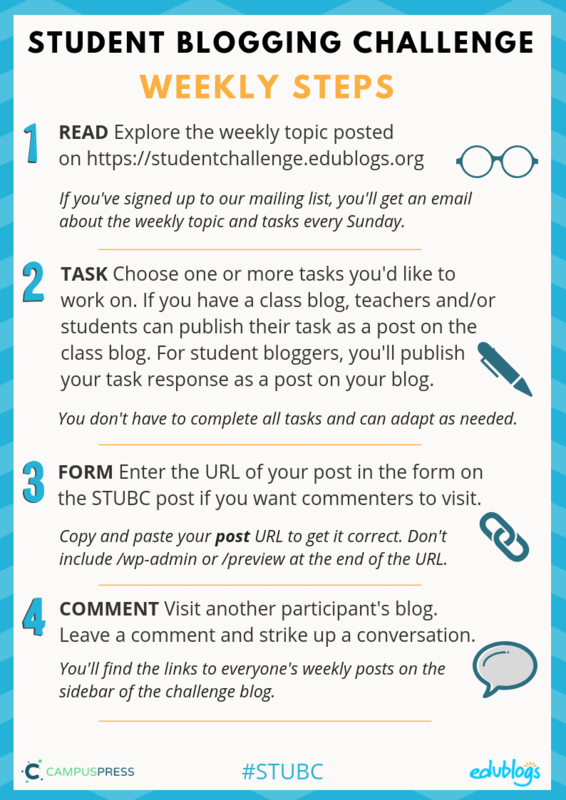 If you want a commenter and other participants to visit your blog, remember to fill in the form below for the post you publish about your week one tasks. You need to submit the URL of your post. You can also submit the URL of your About page if this is what you’ve been working in. Find out how to turn comments on About pages on here. Do not submit the URL of your blog or your dashboard. Click on the title of your post/page and then copy the URL from your address bar. Edit: Enter your details in the form below or click here to open it in a new tab. Teachers, feel free to put the form URL on your class blog if it’s easier for your students to access. This project looks like a great idea to get students actively involved in blogging. The Tasks and step by step instructions are also very useful. 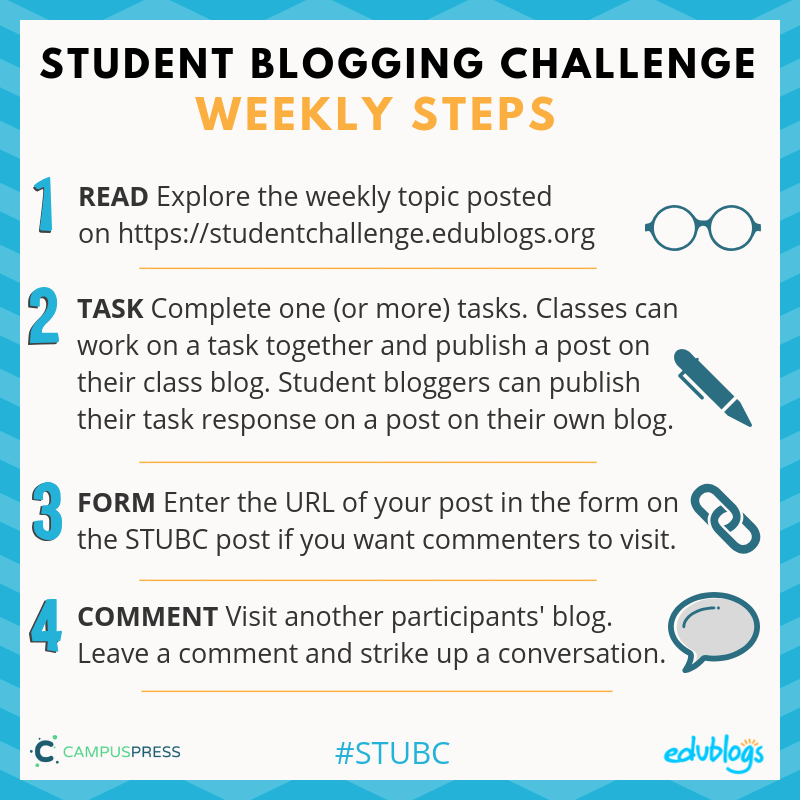 I am new to blogging, I found the blog challenge as part of an assignment for a grad class I am taking. We had to find a student blog project and write a post about it on our own newly created blog. Here is the link to my review https://mrvirmanisworldhistoryblog.wordpress.com/2019/03/14/blogging-project-review/ This challenge is something I will definitely share with my class next year and we will probably take part in the challenge the next time it comes around. Thanks for sharing our project with your readers. We hope to see you in a future challenge. It runs every March and October. I loved making my avatar this week. I cannot find any of these avatar maker apps on my district-approved websites. Any suggestions? We are using SeeSaw as our blogging app. One approach I’ve used in the past is to have students simply draw their own avatar on paper and then take a photo to upload online. Or you could do the same thought of thing digitally using a tool like Paint. Hope that helps a bit. Perhaps others will have more suggestions for you. Here is my link to my post for the week one challenge. Simple question for this newbie commenter–how do I access the blogs I’m assigned to comment on? Sue Wyatt is in charge of our commenting team and she sends you an email each week with the blogs you’re assigned to comment on. This is usually on Tuesday or Wednesday. The reason we don’t send the numbers out at the very start of the week is we wait until students have started completing the tasks and adding their posts to the form. You might have just got an email from Sue actually! It’s full of instructions and includes your numbers. If you need more help, please let us know.